'Hilarious and charming. The most loveable duo since Frog and Toad' - Dav Pilkey, bestselling author of Dogman and Captain UnderpantsNarwhal is a happy-go-lucky narwhal. Jelly is a no-nonsense jellyfish. The two might not have a lot in common, but they do they love waffles, parties and adventures. Join Narwhal and Jelly as they discover the whole wide ocean together. 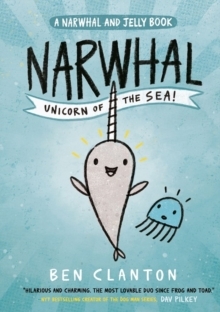 A wonderfully silly early graphic novel series featuring three short stories and a super fun ocean fact page - and joke page too!In the first, Jelly learns that Narwhal is a really good friend. The incessant charm and unabashed joy should make this an easy sell. Swimmingly delightful and a guaranteed smile-maker' - Starred Review, Kirkus Reviews'An utterly enchanting start to a series that's bound to be popular among young readers' - Starred Review, School Library Journal'Geez, Narwhal and Jellyfish are adorable. There's no other word as appropriate for this duo... readers will likely clamour for the next outing' - Starred Review, Bulletin of the Center for Children's Books'Bantering dialogue entertains throughout, but the book's best moment might belong to the third story, when Narwhal lends Jelly his "favourite book in the whole wide water, which is blank...". "It's an imagination book, Jelly!" Narwhal explains. Readers ready for underwater goofiness of the non-SpongeBob variety will be eager for more adventures from this duo' - Publishers Weekly Ben Clanton is the author/illustrator of the NARWHAL AND JELLY early graphic novel series as well as IT CAME IN THE MAIL, VOTE FOR ME!, and REX WRECKS IT. When Ben isn't doodling up stories (and often when he is) he likes to cook, explore outdoors, and play basketball. Ben lives in Tacoma, WA with his wife, son and goldendoodle pup.